As rural and semi-rural communities grow, especially in areas where groundwater is shallow, cesspools and septic systems can contribute greatly to groundwater contamination. High levels of nitrates in groundwater can create toxic algal blooms, which often threaten the health and well-being of our families, pets and wildlife. There is a simple solution when it comes to reducing nitrogen levels in wastewater: let nature do the work. Pugo Systems is a chemical-free residential treatment unit that uses a natural biological process to reduce excess nitrogen discharges to groundwater and surface waters from typical household wastewater. Water that is processed by this natural treatment poses no risk to drinking wells, estuaries, rivers or other sensitive environments. Pugo Systems is the solution when it comes to revitalizing and preserving the environment. Pugo® Systems is an innovative alternative onsite wastewater treatment system (I/A OWTS)—a complicated name for a simple, affordable solution to today’s septic and wastewater challenges. It uses a natural biological process to reduce nitrates in the treated effluent. There’s no need for chemicals, and it is easy to install and maintain. While it is an advanced treatment unit, it requires no advanced degree to operate. From the outside, it’s hard to tell the difference between Pugo Systems and a traditional cement septic tank. Inside is where all the action occurs. 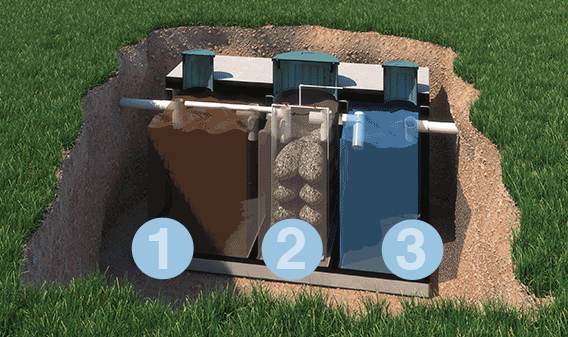 With traditional septic systems, wastewater goes into a cement tank and then exits without any kind of treatment. In the Pugo System, wastewater travels through three chambers and is treated along the way. By the time the effluent exits the system, nitrogen levels have been significantly reduced, and the effluent is so pure, it can be reused to water lawns or even livestock where allowed. The Pugo System is housed in a 3-chamber, 750 gallon concrete tank. A typical concrete tank is more resistant to buoyant forces than tanks constructed of other materials. Naturally-occurring micro-organisms oxidize organic carbon to carbon dioxide and organic nitrogen to nitrate. Other naturally-occurring micro-organisms are then used to reduce nitrate to harmless nitrogen gas. The microorganisms that treat the water fix themselves to the plastic media inside the treatment tank (2) and only clear, treated water is discharged from the tank (3). 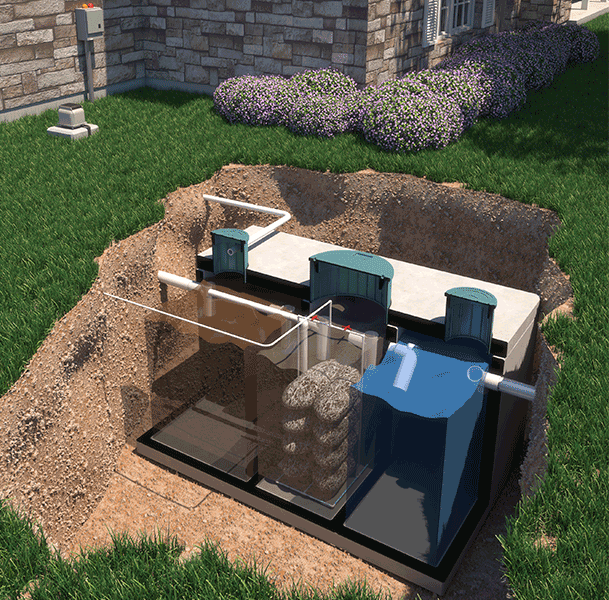 The first chamber separates solids, fat and grease from a home’s wastewater. Solids settle to the bottom and are subjected to anaerobic (without oxygen) treatment. Treated water from the aerobic chamber is also recirculated back to the primary chamber so that nitrate can be removed through biological denitrification. Liquid then flows into the second chamber. As the wastewater circulates, microbes attached to the plastic media metabolize waste and remove harmful nutrients, such as nitrogen and impurities from the water. Because microbes require oxygen, a remote, above-ground blower is used to introduce air into the system. Water in the third chamber is clarified into a clean and odorless effluent, resulting in the need for a much smaller drain field. Where allowed, effluent can be used for drip irrigation of landscaping because it is so pure when exiting the Pugo System. 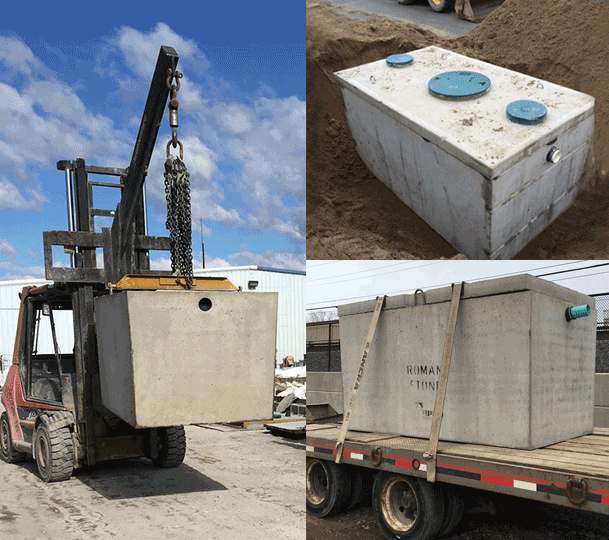 Pugo Systems tanks are manufactured by Adelante Consulting, Inc. • Installation and Maintenance provided by Tom Johnson Crane & Excavating, Bay Shore, NY • Pugo is a registered trademark of Adelante Consulting, Inc.